Have you heard of the tiny-house movement? It's something I've seen picking up speed among the home design world in the last couple years, and in the past couple months I've noticed it's cracking its way into the mainstream more than ever. There are blogs, TV shows and movies dedicated to the building of these homes under 200 square feet, and I find it absolutely fascinating. Last week, I watched the documentary "TINY" on Netflix. I'd been meaning to watch it, thanks to a suggestion from a friend, for a long time, but finally had an open Sunday evening to get down to it. While it wasn't the greatest doc I'd seen recently (that title goes to Bill Cunningham New York...seriously, watch it. You'll never fall in love with another stranger so easily), I was caught up in the world of these adventurous people willing to let go of "stuff" and live sustainably in homes that are the size of some people's bathrooms. The doc follows Christopher Smith (also the creator and director of the film) as he builds his own tiny home with no prior construction experience. We also meet a number of people across the country who've been members of the tiny home community for a number of years. Now, some of these people are what Eric so eloquently refers to as "Smell your own farts" people...a little too into themselves...a little almighty...so it can be a little grating to watch, but the movie makes you realize it's not only possible to live in a small space, but it can also be incredibly freeing. Truthfully, there's a small part of me that can feel a little inferior living in a smaller home. I look at the homes of friends who live in suburbs, rural areas and subdivisions and feel a little jealous sometimes. 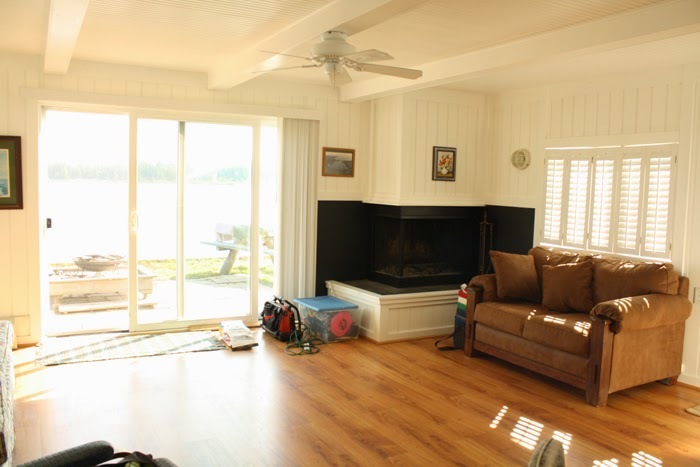 They've got huge spaces with flowing floorplans and more storage space that the entire square footage of our house. I wonder, when they come to our simple home, if they think it's too small, too cramped, too difficult to feel comfortable in. I sometimes wonder how we'll manage if and when our family grows, which is why we're adding a little more space on to our home (project's been put on hold until next spring...more on that later) to create more livable space. Our home is just right for us now, and we bought it because it's in an incredible, sought-after location...I've said it a million times before: I love our little home. But it's easy to feel a little inferior when your peers seem to have it all in giant homes larger than the one I grew up in. But while I watched this movie I grew even happier that we have the home that we do. Our just-under 1,200 square-foot home is more than four times the size of many of the homes I saw featured in "TINY," and we've got a decent (read: dry and finishable) basement and an incredible backyard to boot. Our small home costs less to heat (we don't have air conditioning), is super fast to clean and keeps us in check when it comes to collecting "stuff" (lately I've had to forego bringing home some pretty awesome pieces of furniture because we literally have nowhere else to put anything). It keeps us cozy and close when we're hanging out, but gives us enough "separate" space when Eric's watching pro football in the basement on Sundays while I'm getting my Sam-and-Diane fix via a mini-marathon of "Cheers" in the living room. We're never too far away from one another, while still having enough space where we're not stumbling all over each other. The tiny-house movement has kind of woken me up and made me realize we don't need a ton of "stuff." We don't need extra rooms that we'll never even use and we don't need a big, newly-built home to be happy. 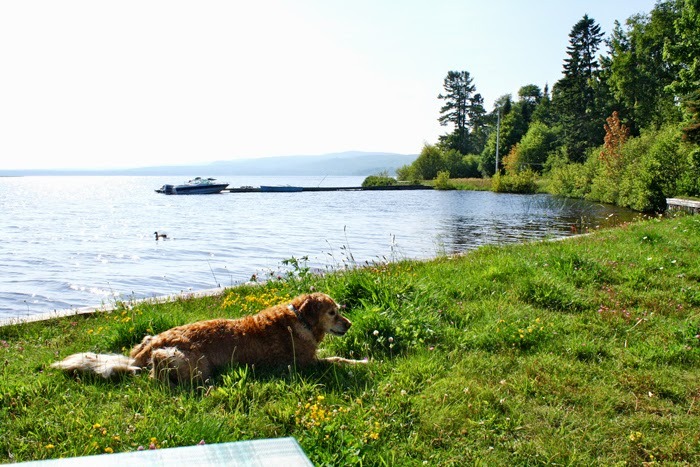 We can walk to the lake in two minutes flat, we've got an amazing little market three doors down from our own and we can walk to more than a dozen bars and restaurants within a one-mile radius. We live on a beautiful block in an incredible neighborhood and I wouldn't trade that for anything. I'm not coming down on big houses, I'm just realizing that, for us, having a small home works. 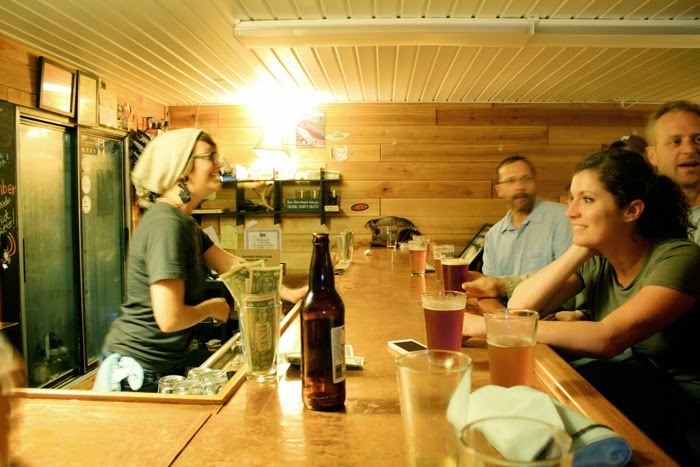 Have you heard of the tiny-house movement? What kind of space do you live in? I'm always curious to learn how other people use the space they live in...if they ever feel like making a purge and getting rid of their excess stuff in order to live a little more simply. There's nothing wrong with having a big house, but I think it's so interesting to see this movement reaching more people and rewiring them to think just how much space they really need to live comfortably. 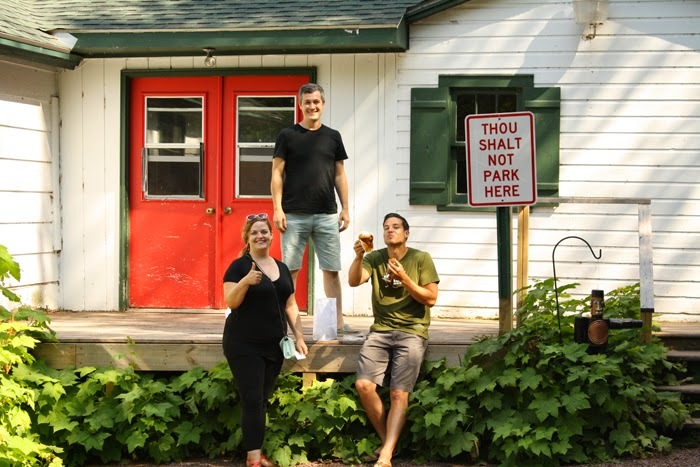 A couple weekends ago, Eric and I traveled to the Upper Peninsula of Michigan with our friends Andy and Emily for a few days of general relaxation. Eric and Andy had visited the U.P. 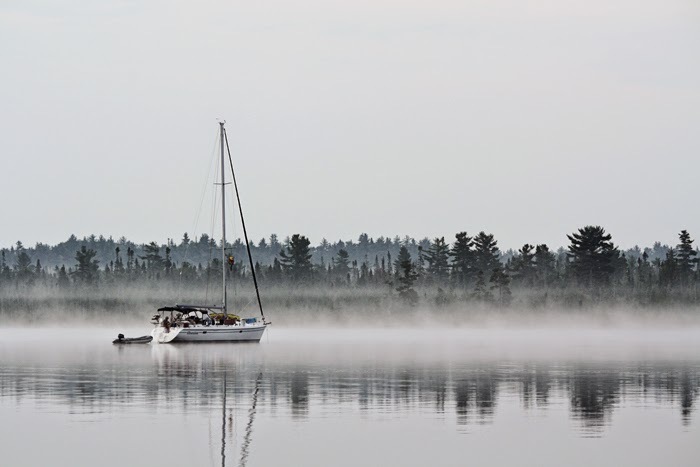 's Keweenaw Peninsula (Mt. Bohemia, to be exact) last winter for a dude's weekend of snowboarding, and as soon as they returned, Eric excitedly began planning a trip for the four of us (plus two pups) to visit come summertime. 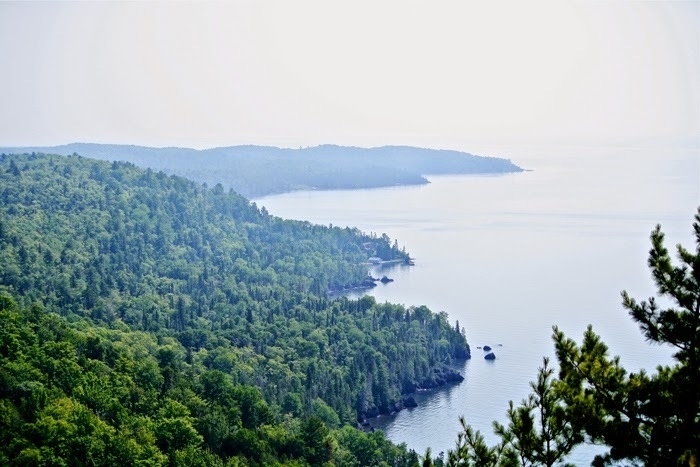 The drive from Milwaukee to the Keweenaw Peninsula takes about seven hours, but it's a pretty drive, broken up by little towns that seem to be stuck in time from decades ago. There's something exciting about driving through a part of your own state that you've never seen before. 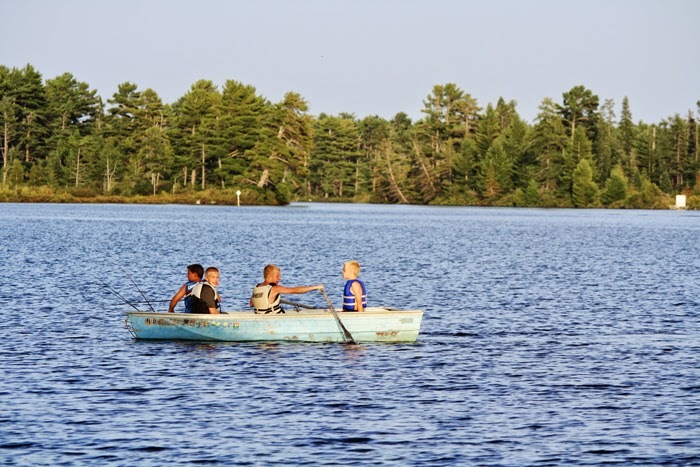 Northeast Wisconsin seems like a completely different world than Southeast Wisconsin, and although I love living in the city, it was a welcome escape to rolling hills and northwoods living. 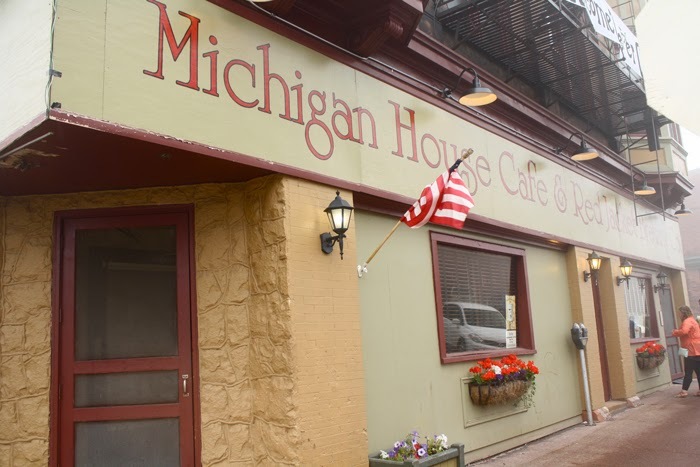 By the time we got to the southernmost part of the Keweenaw, we were ready for lunch and—possibly even more so—a drink. We rolled into Houghton, Michigan, which is a sleepy little college town, home to Michigan Tech. I fell in love with the campus. Set along a little canal, Houghton sits among some rolling, wooded hills, that students have lovely views from their dorms. What's more, part of their tuition includes yearlong lift passes for the ski slope that's just across the canal from campus. That's a pretty sweet deal. 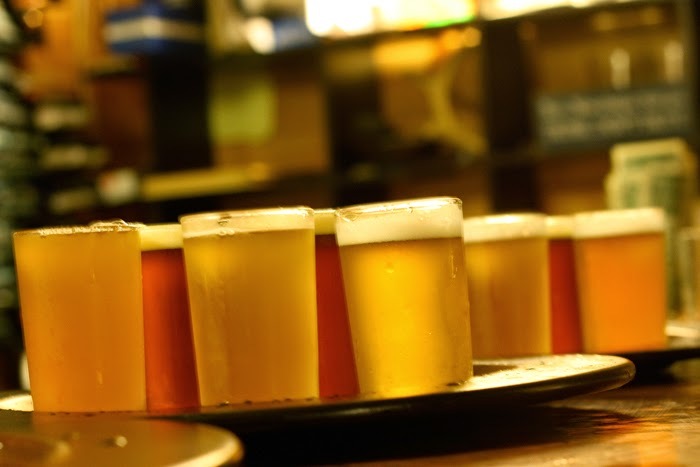 Another sweet deal is the Keweenaw Brewing Company, located on the main drag through town. It's a fairly bare-bones establishment, but I can just imagine how nice it'd be to cozy up in the brewery's lounge area on a cold winter day, sipping on beer by the fireplace. We stayed for one beer each (I had the November Gale Pale Ale, which was pretty delicious), then went on our way. 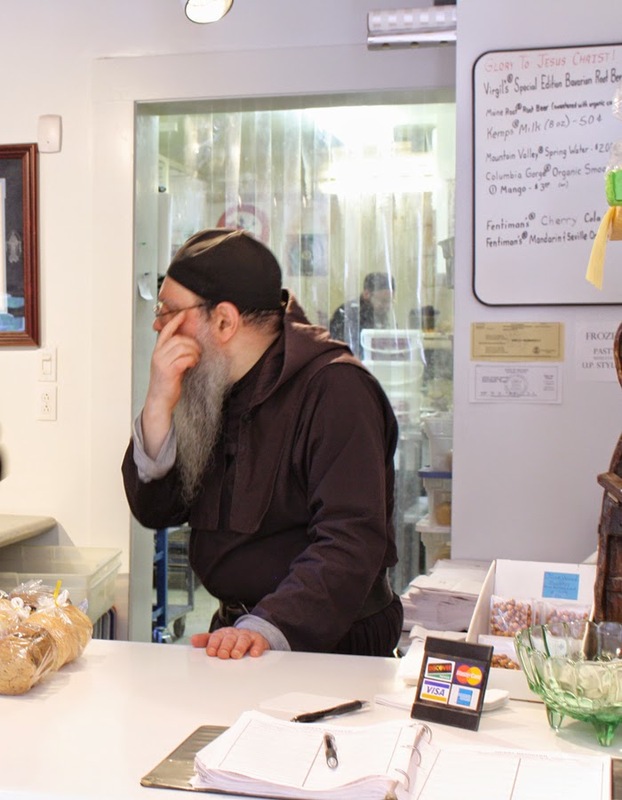 We stopped at a local grocery store in Houghton to pick up groceries for the long weekend, then drove further north into the peninsula to our next destination. 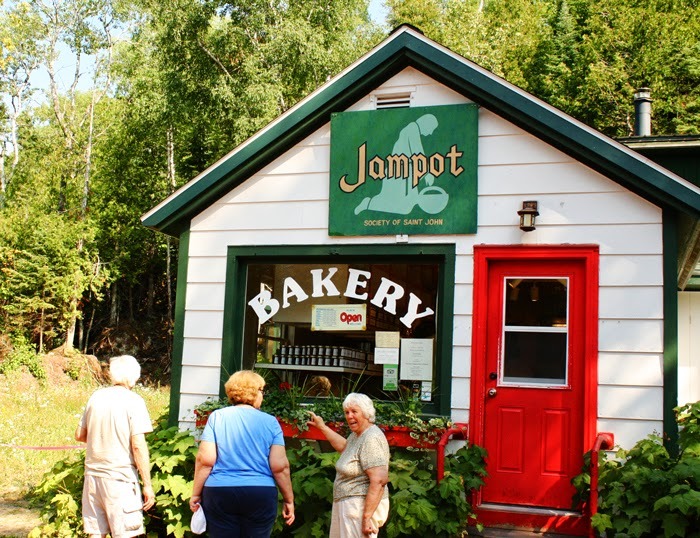 The Jampot is a tiny little bakery near Eagle Harbor that's run by the monks of the Society of St. John. 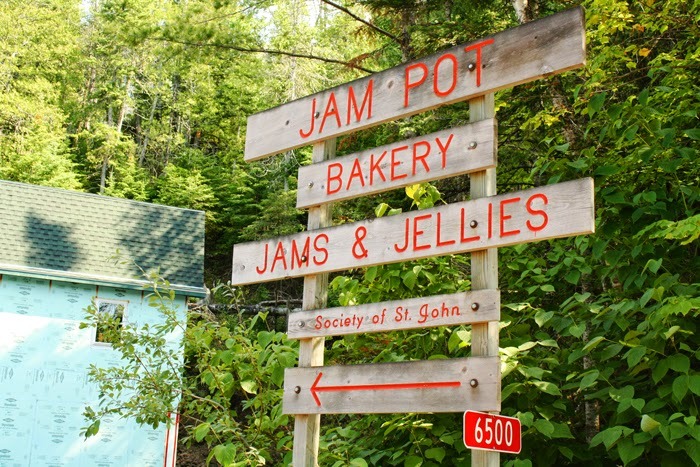 They specialize in jams (duh), but especially thimbleberry jam. 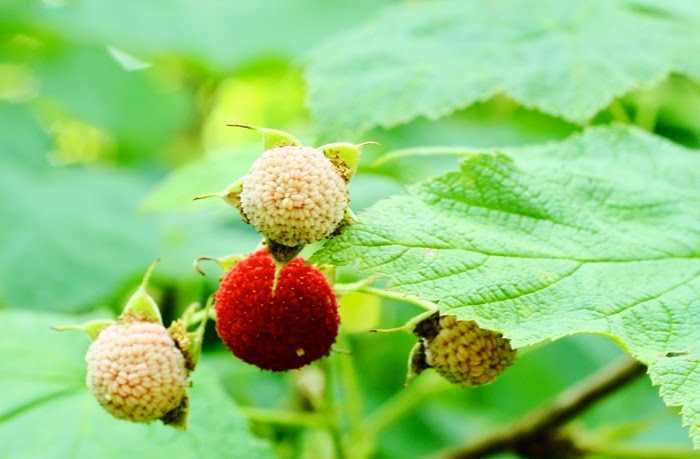 The thimbleberry is fairly exclusive to the Keweenaw peninsula (though we also learned they grow in the Pacific Northwest and also, apparently, New Mexico), and taste sort of like a cross between a raspberry and cranberry. A little bit tart, a little bit sweet. When we arrived around 3:00pm on Saturday, the place was hopping...as I imagine it always is. It made taking pictures difficult, and my anxiety level was sky-high thanks to so many people shuffling around in a tiny space...so we made our purchases and got outside quickly. 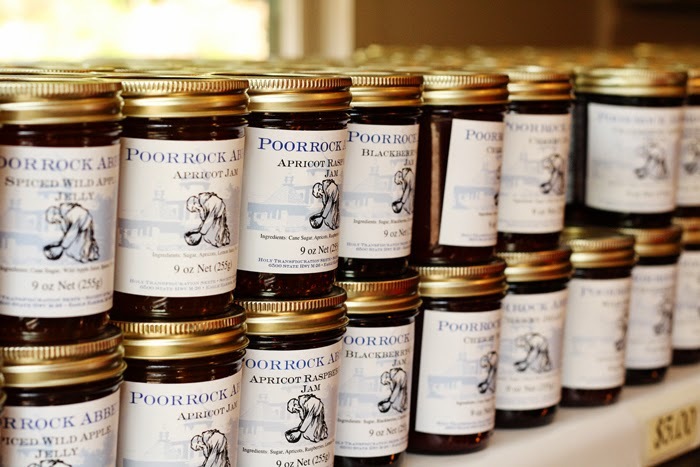 We picked up a couple of jars of jam, some cupcakes and some boozy fruitcake absolutely soaked in brandy (it was amazing). I got a (mammoth sized) gingerbread cupcake that had the most amazing lemon frosting ever. I was in awe of the combination of the two flavors—cozy and tart—and couldn't stop talking about it the rest of the weekend. Those monks know what they're doing. Once we plowed through our treats, it was time to get to our rental for the weekend. It was a sweet little cabin on Lac La Belle, and was actually on a peninsula on a peninsula on a peninsula. 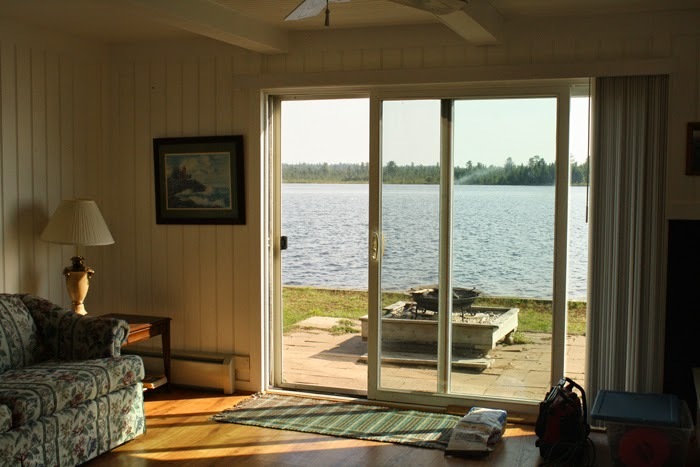 It was quaint and adorable, with beadboard all around and an amazing view from all sides. The lake was literally 10 feet from the house. Next door there was a family with a gaggle of kids. The cousins were having a blast all weekend, and we had a great time watching them diving for mussels, going fishing and tubing. After our first night, we woke up the next morning ready for a hike. We drove to a trail near Bare Bluff with lunch in our backpacks. We hardly needed lunch, though, because the trail was lined with hundred, possibly thousands, of thimbleberry bushes. The weekend we stayed must have been the height of thimbleberry season—they were EVERYWHERE! Our hike probably took twice as long with all our stops to pick berries along the way. And then we got to the serious part. This trail had the best hiking I've found in the area. Full of rocks and shale and roots. 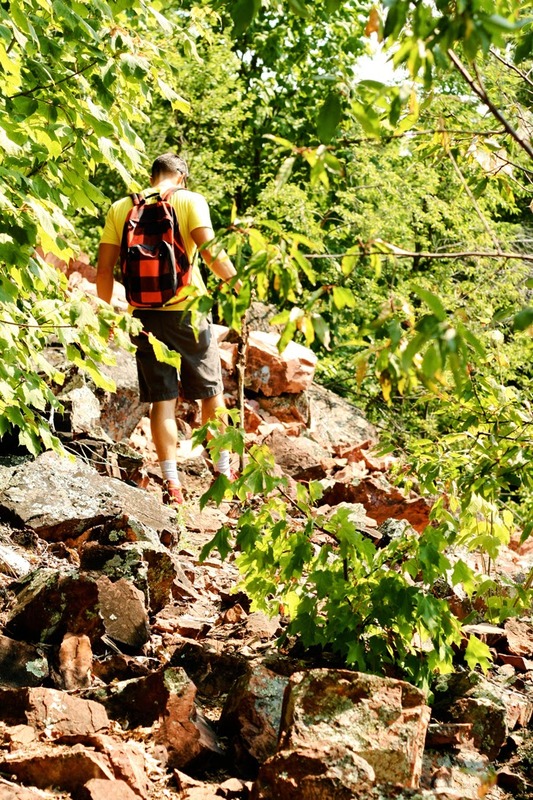 We were glad we left the dogs at home—there's no way they could have made it through the steep and rocky climbs. 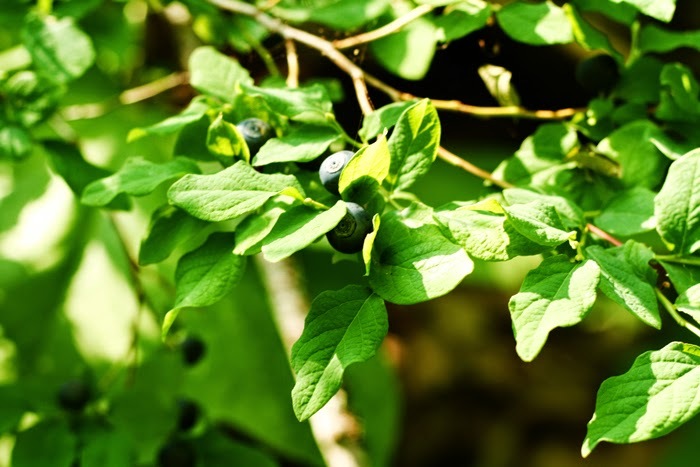 As if we didn't get our fill of berries earlier, we almost stumbled across some blueberry bushes along the trail. Then, after about an hour of sweating our way along the bluff, we made it to the top, and our efforts were rewarded. There were some seriously gorgeous views from the top of the bluff. My photos won't come close to doing them justice. 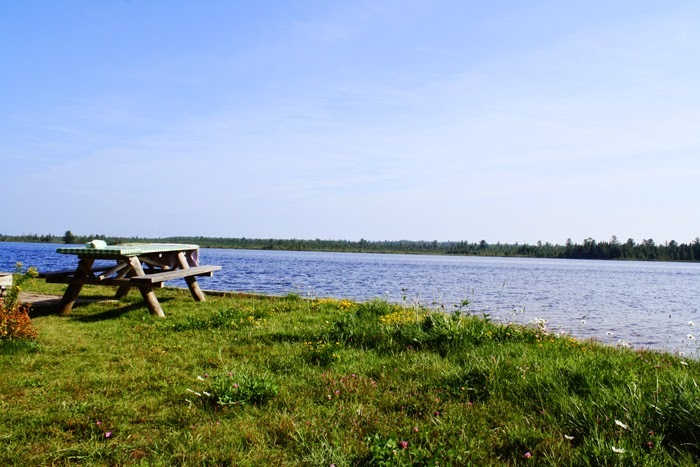 We all sat down and enjoyed some peanut butter and thimbleberry jam sandwiches while we took in the view. This was an afternoon that'd be hard to beat. After the hike, we went back to the cabin, changed into swim gear and packed a cooler. We'd definitely earned an afternoon at the beach, and on an abnormally warm day in the Keweenaw (around 80 degrees and sunny), we treated ourselves to a beach day with a swim in Lake Superior. The lake was clear, with a gorgeous, sandy bottom. It was perfect for swimming. Rain and fog. All. Day. Long. The temperature had dropped about 25 degrees overnight, so we put on our warm clothes and rain jackets. Our plans for another day of hiking were foiled, so we did what we could with the crummy day. Bring on the eating and drinking. 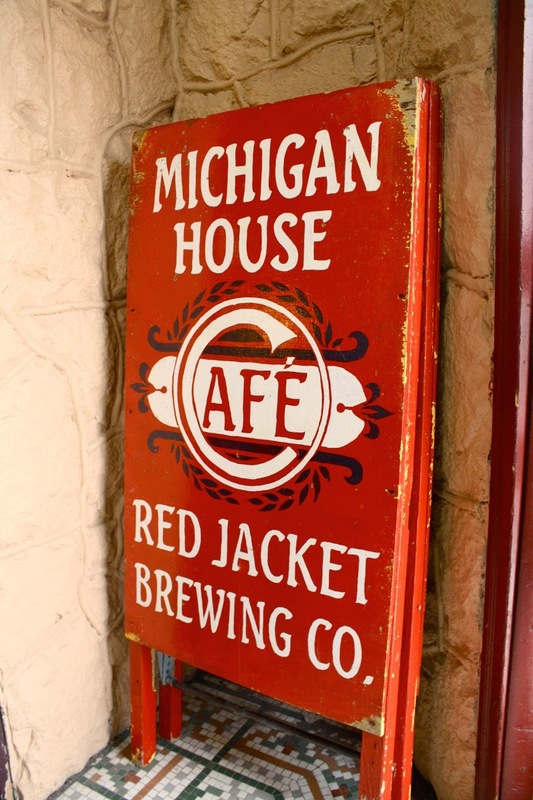 We went to the historic Michigan House Cafe and Red Jacket Brewery in Calumet, which has been in business for more than 100 years. 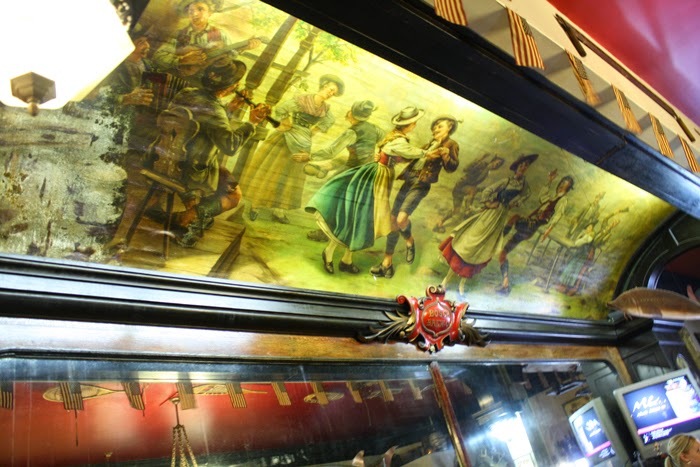 The mural you see curving over top of the old, wooden bar was painted from a Milwaukee artist in 1912. Aside from a little water damage, it was vibrant and lively, even 102 years later. The place was all of history, as we read in the restaurant's menu, and it was a joy to just sit there and look at all the antique treasures around us. 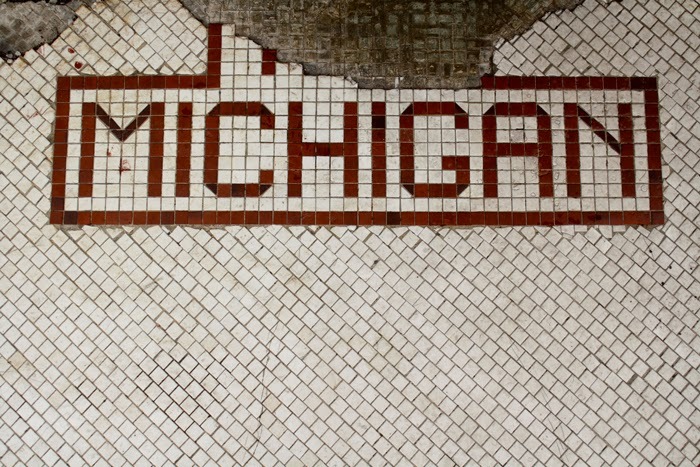 The tilework was original to the building, and was just stunning. We spent some time driving up and down the peninsula, then ended up in Copper Harbor at the Brickside Brewery. 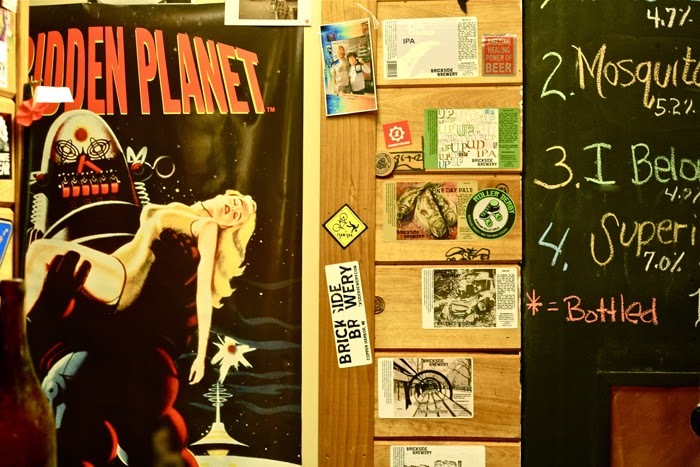 This place redefines "hole in the wall," and sits back in a dark, concrete room, with low light, the smell of yeast permeating throughout the space. 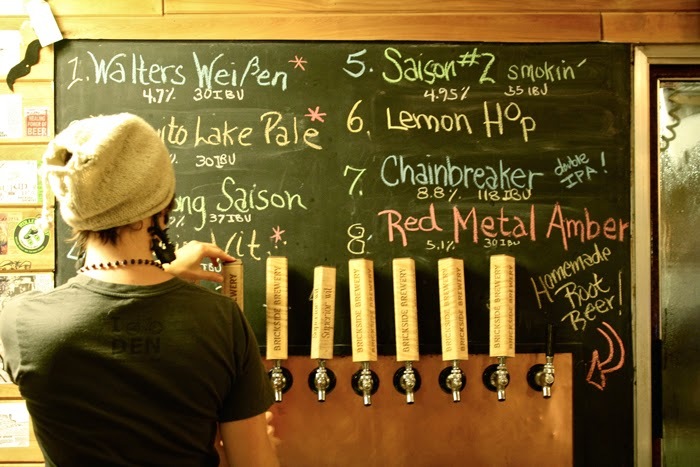 I was impressed with the tiny brewery's beer, especially their Red Metal Amber. But their homemade root beer was the best I'd ever had. It tasted like no other root beer I'd tried before, and I'm still kicking myself for not buying a growler of the stuff to take home. What a treat! 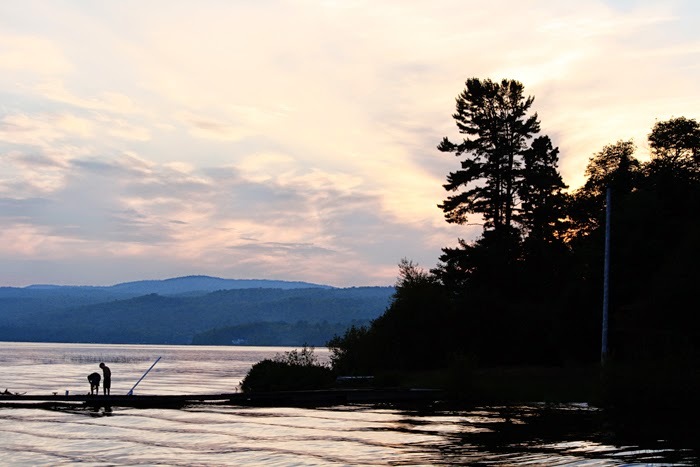 That night, we went back to the cabin, went for a moonlit kayak (under the light of the Super Moon! 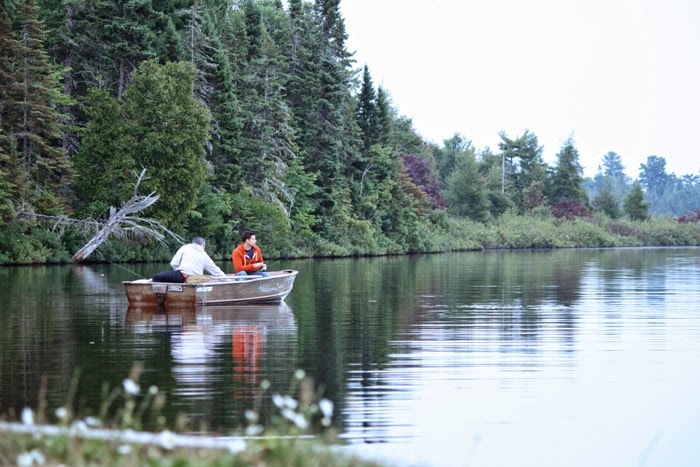 ), the boys went fishing and we all played a game of Cards Against Humanity. Although we were disappointed with a crummy day of weather on our last day, it was the perfect way to spend our last evening in the cabin. The next morning we took our time packing up, sipping coffee, writing detailed messages in the guestbook and eating breakfast. We packed up, ready for the long drive back to Milwaukee. But first, we stopped at the Hilltop restaurant in L'anse, Michigan...because, obviously, we couldn't pass it without splitting the biggest f'ing cinnamon roll I've ever seen in my life (Eric's head next to it for size). Served with a steak knife. That, my friends, is how you end a trip. It's also how you spend the next six hours fighting off a sugar-induced coma in the car. I love this space. I love that it's always here if I need an outlet. If I want to share what's been consuming my days. If I need to break some news. For the last few years, that's been home design and DIY. It's been fun. It's kept me busy. It's been a motivator. But I guess, for the past few months, it hasn't been driving me. It's not my number-one reason for being. Not the driving force for me doing. It's just another thing I'm interested in the sea of things that interest me. But it's not the only thing. I don't want to abandon this space, and I think the only way for me to keep it going is to broaden the focus. I may lose some of you because of this, and I totally understand. I've probably lost plenty already with all the radio silence. I understand. But now this space is going to be for me. No guilt if I feel like it doesn't fit a theme. No worry if I miss a week here or there. No pressure to be on trend. In style. Constantly working inside another life where I'm constantly working. So, here it comes. I'm just going to let this space be about me. I'll never lie and tell you I'm not a narcissist. You've got to be, just a little bit, to run a blog about yourself. So excuse me while I change direction and start using this space as a way to share whatever the hell I want. Will there be a DIY here and there? You betcha. 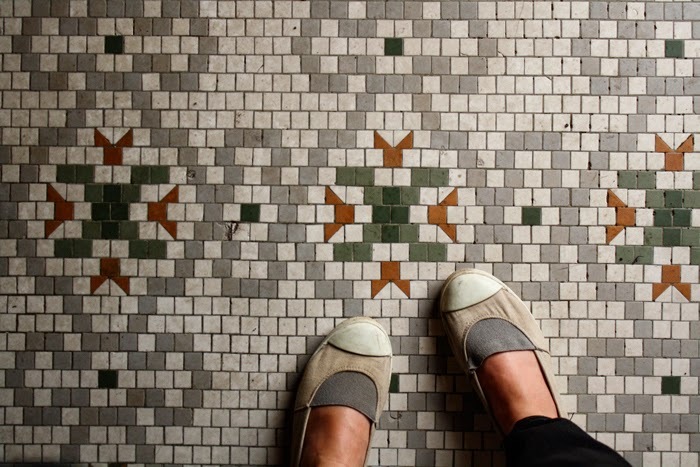 Will I share home style and design trends I love? Uh huh. But I'm also going to talk about myself—what's going on in my life, where I travel, what I'm spending my free time doing, what my thoughts are on headlines...I'm hoping to share a little creative fiction I want to get around to. I want this space to call to me, not sucker me into guilt. It'll be freewheeling. Genuine. Spastic. Sporadic. But it'll be a space that makes me feel better. It'll let me be me, instead of a persona I sometimes feel trapped inside. I'm hoping it will free me to post more. I'm hoping it will be a place you continue enjoying. But if not, don't worry. At least it'll be for me.